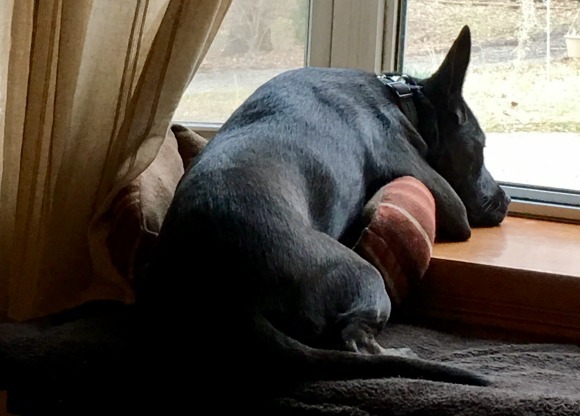 Stacy Tilton Reviews: H2O at Home for your pets! I will be the first to admit giving the dog a bath is a chore I don't not like to do. To be quite frank about it unless I absolutely have to do it myself (because she got into something nasty) I will pawn the task off onto my son to do when he gets home. I figure she's really his dog anyway so why not give him that responsibility. One of the parts I dread is that once she's washed it's time to dry her off, and being a big dog that's quite the task. I'm talking about going through at least two larger sized beach towels trying to get all the water out of her fur. And that doesn't include the water absorbed by my bathroom mats if the towel I throw down doesn't stay put. It's really quite an ordeal, but one that has to be done. Thankfully though we now have an awesome new towel to use for drying her off. It's made from microfiber material, which if you didn't already know absorbs so much better than other materials. I kid you not we used just the H2O at Home microfiber towel to dry her after her last bath! Oh my goodness was I excited. My son was kind of like meh, whatever mom. You know kids, it's not as if he had to do the wet laundry or clean up the bathroom after so he didn't really care. But I sure did, it was pretty awesome how the towel absorbed the water from her fur. We also got the chance to try out a bar of their Pet Soap and I really liked it too. It was pretty easy to use vs. liquid shampoo because we had better control of where it ended up on her body. And after she smelled like a fresh pup and even had a nice shiny coat. I think she enjoyed the bath, but boy did it tire her out. She had to take a nap when we were all done. 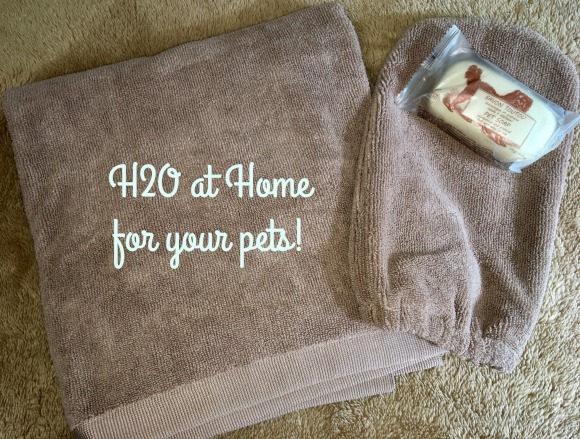 For our furry friends, H2O at Home offers the Pet Kit ($29), which includes a microfiber glove and towel that are ideal for bathing and drying your pet quickly. The glove features an elastic band that helps to keep it in place while washing, and the comfy microfiber towel ensures a quick dry. Use the glove to wash your pet or to dry your pet’s feet, and use the towel to remove excess water. The Pet Soap ($19) is an easy-to-use, 3-in-1 soap that will gently clean, moisturize and help repel fleas and ticks. Its mild cleaning base will match the pH of your pet's skin and moisturize and condition for a shiny, healthy coat. Economical and easy to apply, this solid bar will last as long as two bottles of liquid pet shampoo. It will last for more than a dozen washes for a medium sized dog. It is unscented, preservative-free and contains 1% organic neem oil to naturally fight against ticks and fleas without irritating sensitive pets. H2O at Home is an innovative home and personal care company that is changing the way people clean. H2O at Home was founded on the simple premise that all you need to clean safely and effectively is a high-quality microfiber cloth, water and, in some instances, a natural cleanser. The company adheres to strict European eco-certification standards for the organic and natural ingredients in of all its products. I love H2O at Home. It feels really good to have a clean, safe home and know that I am helping to protect the environment too! I know what you mean. No more wasting paper towels to dust. And no more harsh chemical smells while cleaning. I am not a fan of giving the dogs baths also. I have resorted to taking them to our groomer to giving them their baths. I love the Micro Fiber Clothes. They are great for cleaning. Micro Fiber towels are great for drying dogs. Thanks for the post. I have never tried H2O at Home but man all of these sound so good! The 3-in-1 soap sounds like just what we need! email me, I would love to tell you more about our company and products! AS ALWAYS-no pressure to buy, I just love to educate about cleaner living!